Nine pastors from different Trinitarian denominations were baptized in Jesus' name. In 2009, many people from different denominations, for the first time, heard and received this message of the Truth of the Bible that we teach and preach. They admitted that the Holy Spirit can do anything. A weekend revival yielded numerous healings, eleven receiving the Holy Ghost, and seven being baptized in Jesus' name. Five were baptized in Jesus' name, two received the Holy Ghost, and two testified of healing. Our regional missionary and his wife have been invited to preach the gospel at different congregations. Fourteen were baptized in Jesus' name, and seven received the Holy Ghost. Children's Week entailed special services led by children throughout the week in most local churches. Sunday was the culmination of all festivities. In one assembly nine children were baptized in Jesus' name and five received the Holy Ghost. Throughout the regions of the country, a total of 123 received the Holy Ghost and 249 were baptized in Jesus' name. A Gospel church has joined our organization. A church was built in one region. 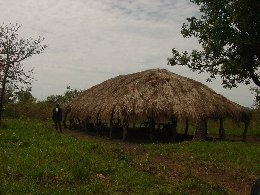 Land was purchased for a church in another region. Fifteen backsliders returned to the church in one town and eight have been baptized. A pastor's wife was healed after being sick for almost a month. Eighty-three were baptized in Jesus' name, forty-three received the Holy Ghost, and nineteen testified of healing. One young person was delivered from demons through prayer. Through prayer a lost child was found. A total of five received the Holy Ghost, and nine were baptized in Jesus' name. The leadership development seminar for pastors and leaders is going well with several new workers feeling the call of the Lord. Ladies Conference in one region had 1,200 in attendance. All were gathered for teaching, worship, and fellowship. 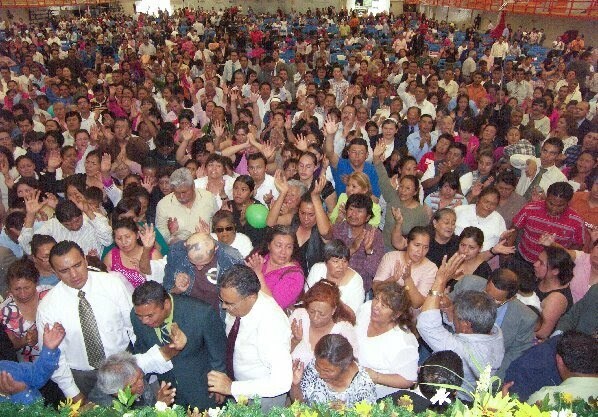 During the week of regional conference, a total of 181 received the Holy Ghost. Lives were blessed, hearts strengthened and encouraged, and bodies healed. At a crusade, 459 received their personal Pentecost. At one church the Sunday attendance is now over forty-five, and home evangelistic work continues. The prayer meeting attendance is also increasing. A pastor, recovering from two strokes at his home in the village, has baptized many in Jesus' name, and fourteen received the Holy Ghost. At two other churches, nine have received the Holy Ghost, and they are believing for many more souls in celebration of Pentecost. Sunday School/Children's Evangelism Seminars are happening around the capital city--creating excitement amongst teachers and pastors. 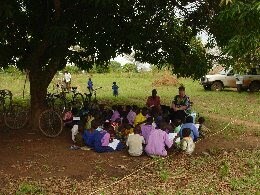 The Bible School is almost completed. At a seminar, three received the Holy Ghost. Two of the three are pastors who applied to join our church. They also will be baptized in Jesus' name and plan to travel to the capital city for a Bible study. Twelve were baptized in Jesus' name at a new church. Two received the Holy Ghost at another newly constructed church. In a different town, eight received the Holy Ghost, and many testified to healing. At two more seminars in separate regions, a total of twenty-four received the Holy Ghost and twenty-eight were baptized in Jesus' name. Three assemblies also want to join our church. The pastors of these assemblies will be attending the ministers' seminar in June. At yet another seminar in the north of the country, nine were baptized in Jesus' name and one received the Holy Ghost. A Trinitarian pastor prayed through to the Holy Ghost and was baptized; he is now working with our church. When those from the seminar went to the lake for the baptisms, a lady was there waiting. She had prayed for several days and felt the Lord tell her to go to the lake where churches baptize. She found our church and joined those to be baptized in Jesus' name. She now attends our church close by. 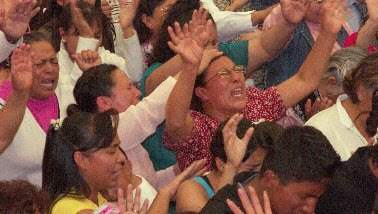 Two were healed of AIDS. After testing, they show no positive HIV virus. Six more churches have joined ours this month. Two of the pastors received the Holy Ghost. A total of seventy-one received the Holy Ghost throughout the missionary's travels, including two more pastors. Twenty-one were baptized in Jesus' name. At National Youth Conference, the attendance averaged 685, with Sunday's attendance being 1,299. Thirty-nine youth received the Holy Ghost, and thirty-one were baptized in Jesus' name. In sectional services in the Central District: Over 210 were reported receiving the HG Saturday - that's just in Mexico City. In the local church that I pastor--in the heart of Mexico City, we had not only 14 receive the Holy Spirit in the services on Sunday, but a total of 82 since Easter Sunday! 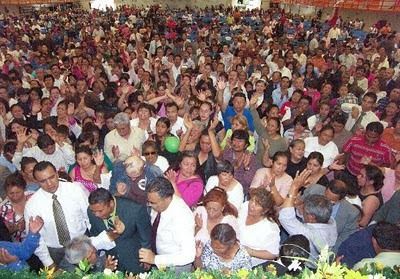 In Mérida, Yucatán, where Brother Martín González is Pastor - he is also the Vice President of the UPCM: In a Pentecost Sunday Rally, over 132 received the baptism of the Holy Spirit. CENTRAL DISTRICT GROWTH: In our last monthly pastors' meeting (the first Monday night of each month), the pastors of the Central District reported a total of 230 baptized, and 186 received the Baptism of the Holy Spirit during the month of April 2010. 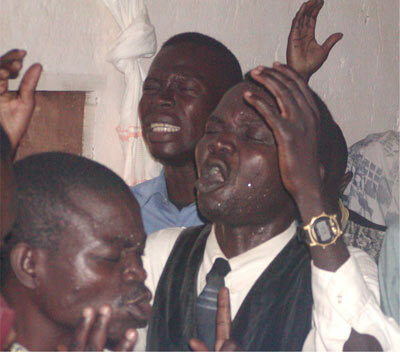 Those Pastors' Monthly Meetings are a time of inspiration, reporting, collecting ministerial tithes, offerings, etc. Rejoice and give thanks with us. To God be the glory!